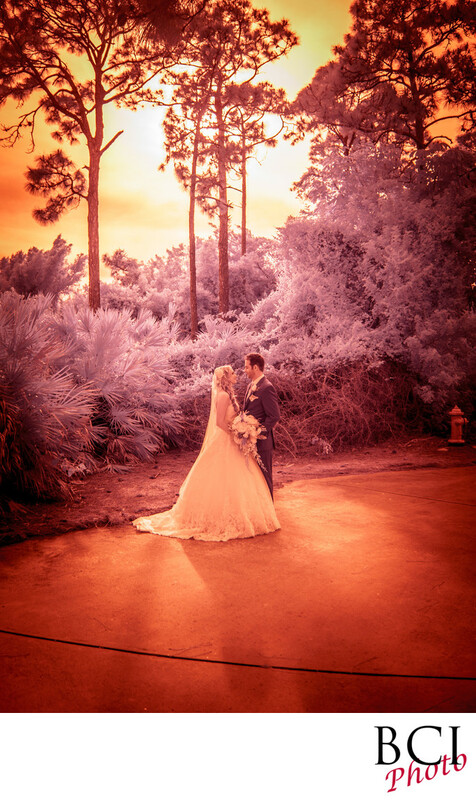 This is an excellent example of one of our custom toned infrared wedding portraits. Taken with an infrared converted camera, this romantic portrait takes on an otherworldy feel to it. Such dramatic colors and lighting make this a favorite of our brides and grooms. The Santa Lucia Riverclub at Ballantrae in Pt St Lucie, Florida. Which is one of the best wedding venues in the state of florida. Here we chose to not only shoot these romantic wedding portraits using visible light and traditional methods, but we opted for infrared capture as well. A client favorite, which is not only on my studio walls but their own as well. This image, we selected our "strawberry" tone, which is a custom technique that we have developed and is uniquely available only from Brads Creative Images. Other processing techniques are employed as well, for renderings in monochrome, black and white, or chocolate flavors each rendering their own unique sensation to the scene. Often our clients use the infrared set of images for use on their album covers, thank you cards, and wall portraits. The immense wow factor and totally different look command attention wherever they be displayed.